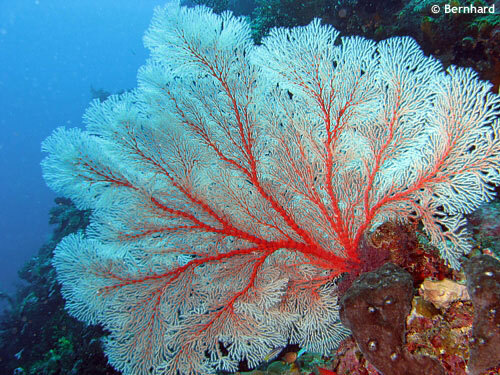 Just 400 m away from shore is this great UW mountain, full colorful of soft corals and seafans. Mountain starts at 14 m dropping down to 40m, clear water, mostly slide currents and lots of pelagic fishes. Selayar Island is still a untouched and unspoiled tourist destination with spectacular dive sites on west and east. A small cozy resort in a huge park awaits you, extraordinary dive spots with soft, hard corals, sea fans, small caves, overhangs. Selayar has one huge dive site, almost the whole island. The eastern part (Nov. to April) offers spectacular walls, overhangs, pelagic fishes, sharks, rays, Napoleons. The western part (April-Nov.) slopes down to around 18 mtr, full of Critters, Bump-head-parrot-fishes. Where ever you dive, it’s a new adventure every day.